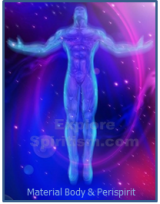 The perispirit, a semi-material envelope that survives the body and accompanies the spirit in all states, uniting it to the material body when the spirit is incarnated, is crucial to the understanding the nature and operation of the spirit. It has many important functions in the spirits' interaction with the spiritual and material worlds, as well as its own evolution. You can read more about it by reading the subsection entitled "The Perispirit, or Spirit Body", found on the menu at left. Kardec, Allan. "The General Elements of the Universe " The Spirits' Book. Trans. Allan Kardec Educational Society (translated from 2nd edition in French). Philadelphia, PA. Allan Kardec Educational Society. 1996.1-4. Kardec, Allan. "The Incarnation of Spirits." The Spirits' Book. Trans. Allan Kardec Educational Society (translated from 2nd edition in French). Philadelphia, PA. Allan Kardec Educational Society. 1996. 50-54. Barbosa, Pedro Franco. "O Homem" [Man] Espiritismo Basico [Basic Spiritism]. 3rd ed. Rio de Janeiro-RJ, Brazil: Federação Espírita Brasileira [Brazilian Spiritist Federation].1987. 152-163.